While eMachines is not the best-known brand, it provides a good range of entry-level laptops ideal for those on a budget. Its G525-902G16Mi is a highly likeable big screen laptop, but is unfortunately flawed by limited power and features. With its striking 17.3-inch screen, this is a great choice for viewing movies and photos. As well as its size, the screen is far brighter and more vibrant than its rivals, making it comfortable to view in all conditions. We found the Super-TFT coating inevitably reflective, however. Disappointingly, graphics performance is very low, with only the most basic multimedia use possible. The integrated Intel graphics card quickly struggles with demanding video editing tasks, but basic photo editing is possible. Office performance is equally limited and only suits general tasks such as word processing and browsing the internet. 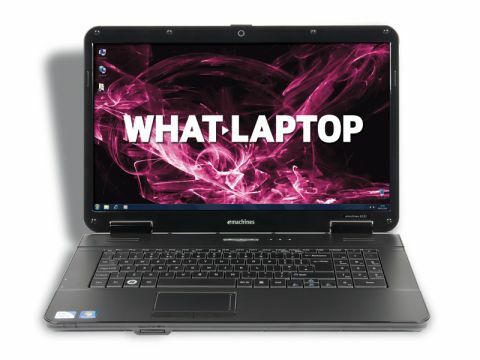 The low-powered Intel Celeron processor is backed by 2048MB of high-speed DDR3 memory, so basic multi-tasking is possible, but the Mesh Edge15 Value is a faster choice. Storage is another area where this laptop falls short of expectations. While the 160GB hard drive will be capacious enough for most people, the Acer Aspire 5810TG-354G32Mn and Mesh Edge15 Value double its capacity, so if you plan to store thousands of photos, music and videos, it may be quickly filled. Where the eMachines truly stands out is its solid build quality and great usability. While the matt-black chassis and textured lid provide a conservative appearance, they also make the laptop very resilient, ensuring you can let the family loose on it without too much fear of damage. Due to the big screen, the 2.8kg chassis is fairly large and heavy so has been built for use at home. The 259-minute battery life is quite good so you can easily work around the home. It should be noted, however, that this drops to 131-minutes when watching a DVD. The spacious keyboard is ideal for long term use, as it features large keys and is extremely comfortable to work with at all times. A full numeric keypad is also in place. Unfortunately, the limited features of this machine fall behind its rivals here. Only two USB ports are in place and the 802.11g Wi-Fi and 10/100 Ethernet connectivity provide slower wireless and fixed network access than other machines. In short, the G525-902G16Mi is very much a mixed bag. While its stunning screen and great usability are easy to like, the limited power and features mean many users may quickly outgrow this machine as their skills develop, so be sure to consider your future needs before buying.